HGOR has worked with Cox for over fifteen years on numerous projects. HGOR was selected to provide landscape architectural services for Cox’s new corporate headquarters in the Dunwoody neighborhood of Atlanta, which includes a 10-acre wooded park and a 3-acre private garden for employees. The private garden explores traditional garden themes within dynamic modern forms, reflective of the rich history and progressive nature of both Cox Enterprises and the community where it operates. 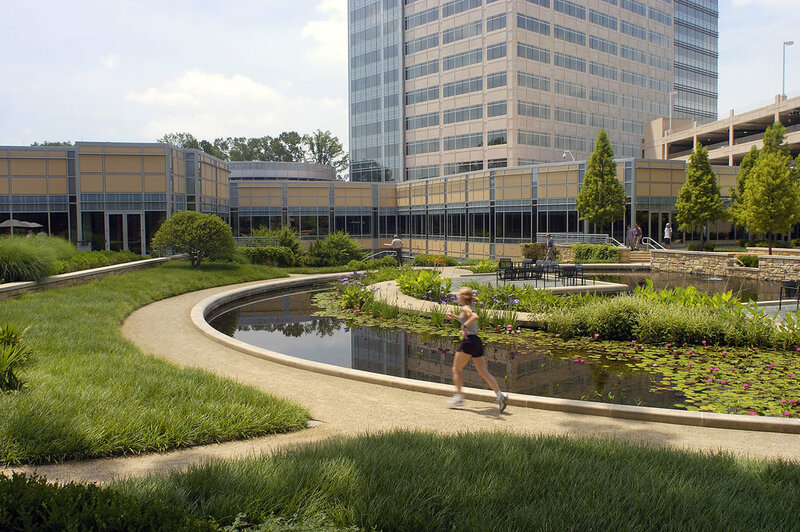 HGOR was engaged by Cox Enterprises to assist in the planning and design of their corporate headquarters facilities originally design by the firm in 2000. The expansion plan creates a strong sense of campus and communal space by extending the current garden to be flanked by two 300,000 sf office buildings and connecting to a newly acquired 145,000 sf building. The garden level is supported by dining and meeting facilities on the ground floor of the new buildings. Parking is located in podium levels below the garden and building adding to the pedestrian-orientated campus framework.